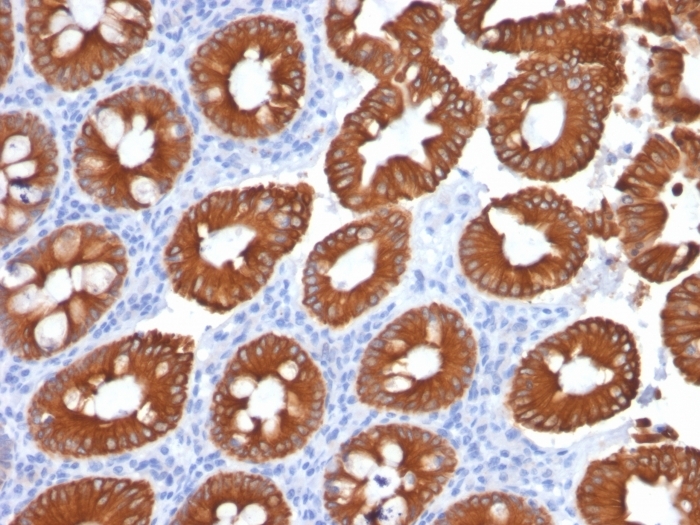 Formalin-fixed, paraffin-embedded human Colon Carcinoma stained with Cytokeratin 20 (KRT20) Mouse Monoclonal Antibody (KRT20/1991). 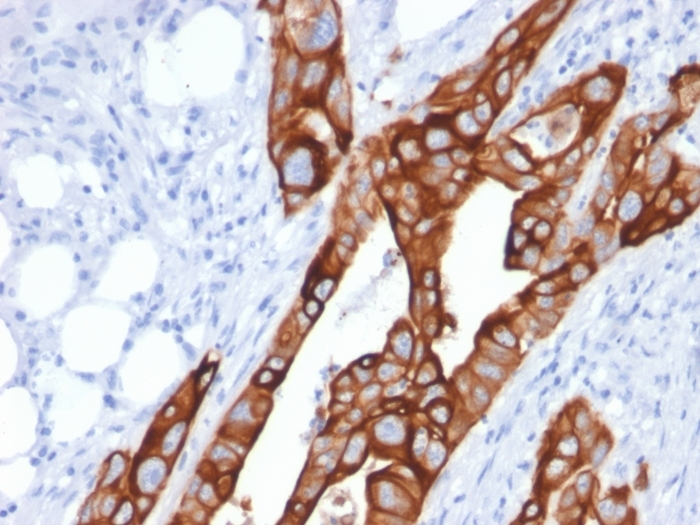 Formalin-fixed, paraffin-embedded human Normal Colon stained with Cytokeratin 20 (KRT20) Mouse Monoclonal Antibody (KRT20/1991). 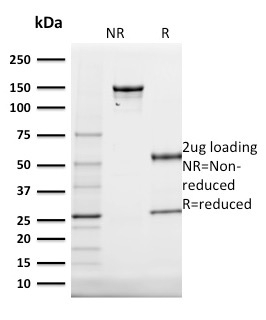 Western Blot Analysis of human HT29 cell lysate using Cytokeratin 20 (KRT20) Mouse Monoclonal Antibody (KRT20/1991). 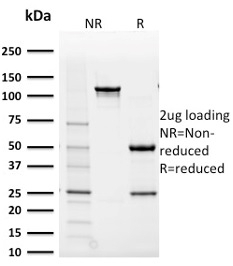 SDS-PAGE Analysis Purified Cytokeratin 20 (KRT20) Mouse Monoclonal Antibody (KRT20/1991). Confirmation of Purity and Integrity of Antibody. Analysis of Protein Array containing more than 19,000 full-length human proteins using Cytokeratin 20 (KRT20) Mouse Monoclonal Antibody (KRT20/1991). 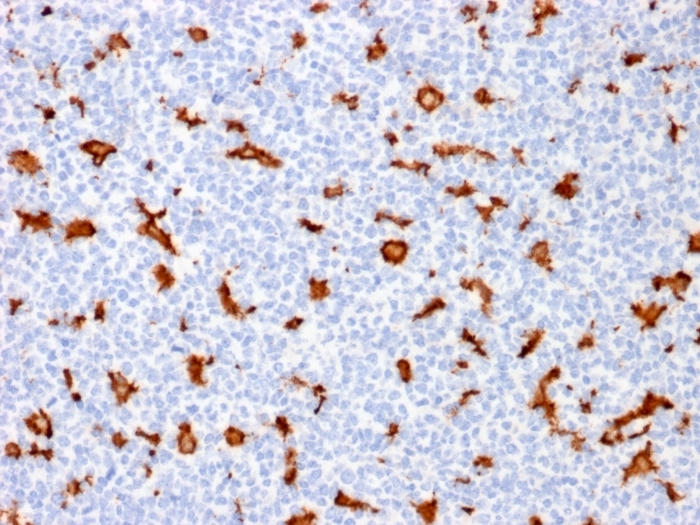 This MAb recognizes an intermediate filament protein of 46kDa, identified as cytokeratin 20 (KRT20). KRT is abundantly expressed in goblet cells and enterocytes of the gastrointestinal tract. It is a useful marker of pancreatic and colorectal cancer. 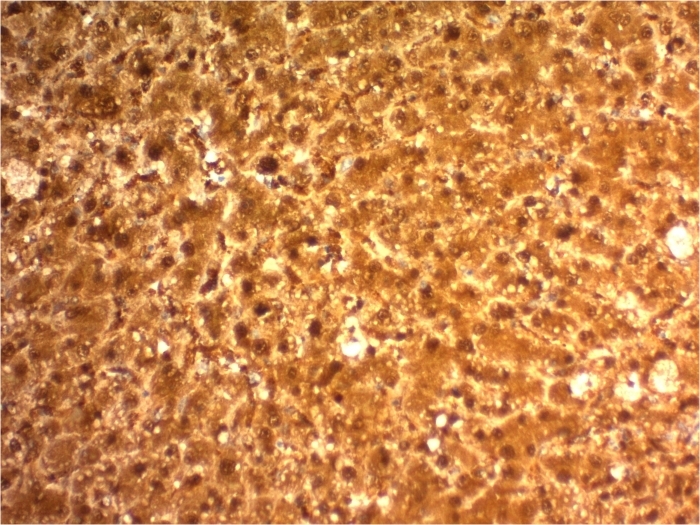 KRT20 is expressed under normal, hyperplastic and neoplastic conditions. It has been detected in adenocarcinomas of the colon, stomach and biliary tract. Breast carcinomas are generally non-reactive. Wauters, C.C., et al. 1995. 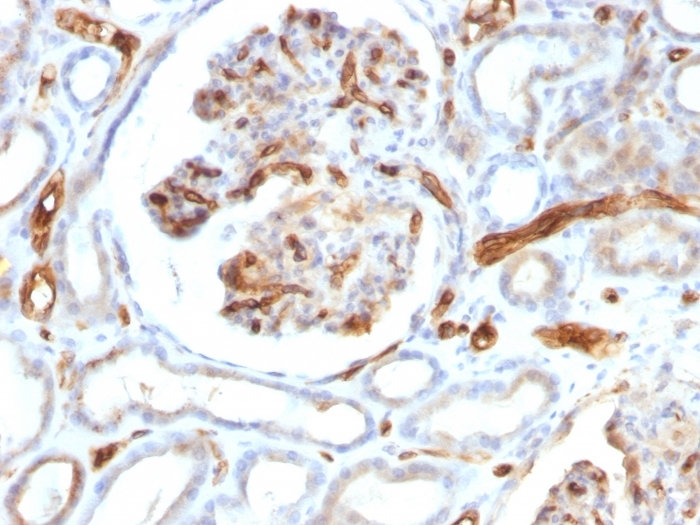 Keratins 7 and 20 as diagnostic markers of carcinomas metastatic to the ovary. Hum. Pathol. 26: 852-855. Moll, R., et al. 1993. The human gene encoding Cytokeratin 20 and its expression during fetal development and in gastrointestinal carcinomas. Differentiation 53: 75-93.